The index opened weak but saw a slow and steady rise on low volume to the highs of the day at 8295 but closed just below at 8284.00, small gain of 1.30 points. The broader market was also positive, with 1022 advances to 497 declines. Range as per OI Table is 8000-8600. Call option 8400-8800 added huge 9.44 lacs OI with short covering seen at 8300 and below strike prices. Put option 8300-7900 added huge 6.34 lacs OI with small short covering seen at 8600 and above strike prices. 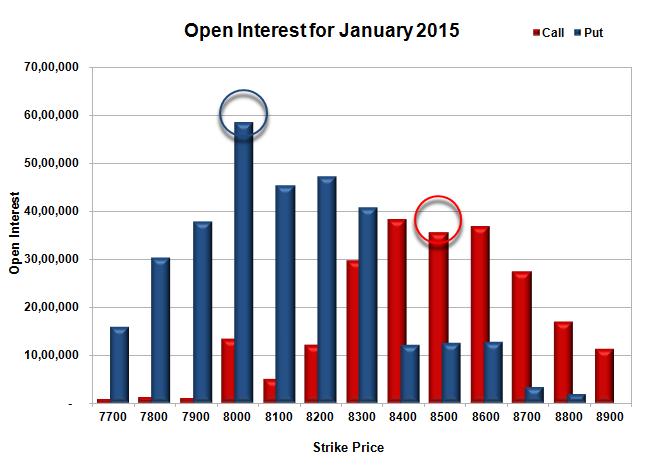 Nifty Open Interest is at 2,11,40,550 down by 28,675, with small increase in price, most probably short covering. 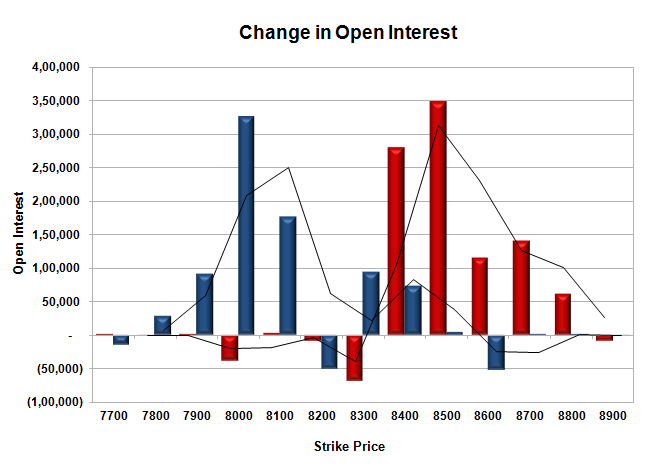 Bank Nifty Open Interest is at 19,60,450 down by 3,300, with small increase in price, most probably short covering. FII’s sold 0.66 lacs Futures, which includes 2277 contracts long build-up and 4905 contracts short build-up, with increase in net OI by 7182 contracts (includes 9852 longs to 12480 shorts for the day) and the Average Price comes to 8569.05. FII’s Index future open contract as on date is 604510 Longs to 81589 Shorts, net long 522921 down by 2628 contracts. Initial support at 8300, with OI of 40.83 lacs and below that at 8200 with OI of 47.31 lacs. Initial and best resistance at 8400, with OI of 38.19 lacs and above that at 8600 with OI of 36.82 lacs. 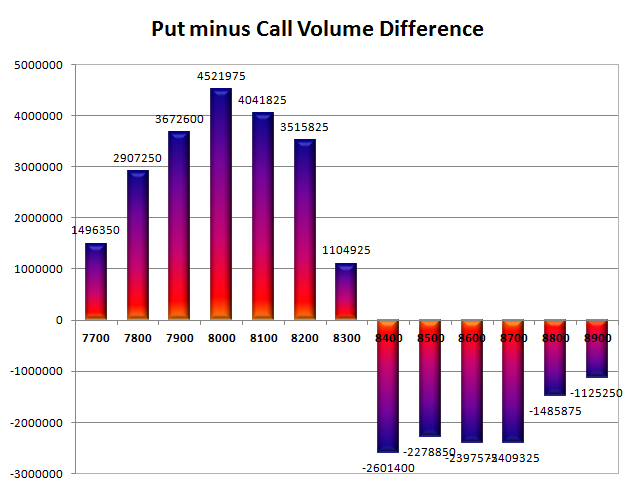 Day Range as per Option Table is 8216 - 8344 and as per VIX is 8219 - 8349 with 8276 as the Pivot.